The fantastic success of last years pāteke / brown teal translocation will see 70 more of the ducks released near Awaroa next month. Last May 20 juvenile pāteke were released on the banks of the lower Awapoto River at Hadfield Clearing. The birds have had a 90% survival rate, and two clutches of six ducklings have also fledged meaning DOC’s Pāteke Recovery Group has given the green light to a much larger release this year. Pāteke are found at only two sites on the South Island mainland. They were once facing extinction but intensive predator control and the reintroduction of captive bred birds has meant they are now in “recovery mode”. Pāteke Recovery Group captive co-ordinator Kevin Evans says it’s really nice to see the ducks have bred in the Abel Tasman in their first year. “The team is doing a brilliant job. Trapping is obviously working well, and DOC has been fantastic, monitoring and feeding the ducks in their new home. The Abel Tasman is a beautiful looking habitat, so hopefully they will continue to survive and breed, producing a self-sustaining population,” he says. In December a camera captured images of six new pāteke/brown teal ducklings – the first time in living memory the duck has bred in the Abel Tasman. DOC biodiversity rangers John Henderson and Dan Arnold were delighted to then spot another clutch a few weeks later. “It’s a good site. From a management perspective it’s a pat on the back to be allowed to release more. With a lot more ducks in the area we will increase the number of feeders, but it’s likely the birds will disperse to other areas of the Park,” says John. Most of the ducks have stuck around the Hadfield Clearing site, although a couple have ventured towards Totaranui, and another has been spotted near the Awaroa Lodge. Around 90% of the Abel Tasman is currently stoat trapped, and feral cats are trapped in the Awaroa area to protect the ducks. 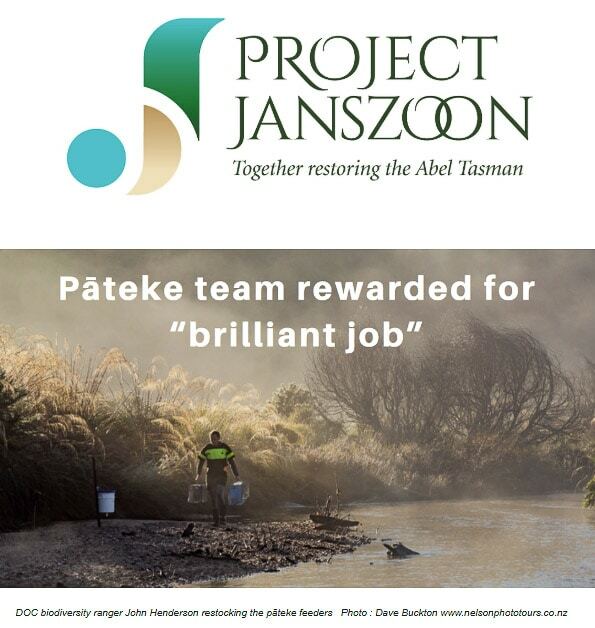 As a friend of Project Janszoon we would love to invite you to attend the pāteke release on Thursday 3 May – please RSVP via the link below and we’ll send you more details.